The cliff of Caorle is one of the beautiful and unmissable walks of our sea. It is indescribable the magical feeling you have walking along the promenade, accompanied by the beautiful sculptures on the rocks of numerous internationally renowned artists and, as background, the fascinating church of Madonna dell’Angelo. 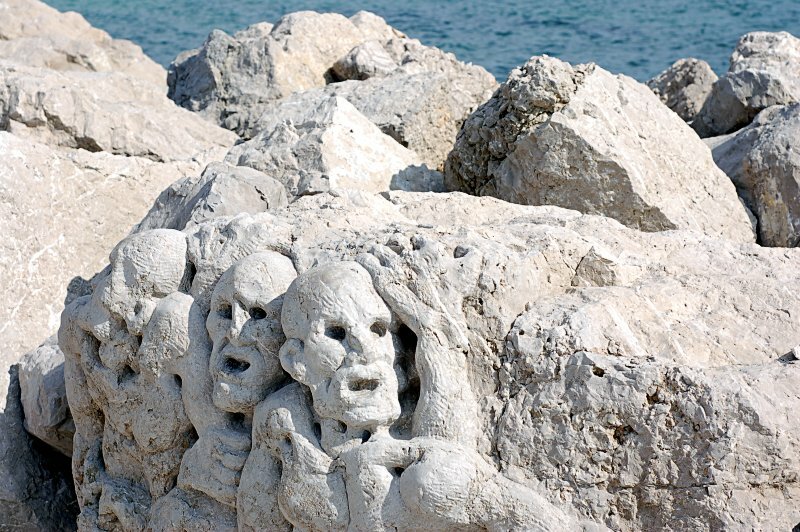 Everything started in 1992 when the sculptor Sergio Longo decided to embellish the rocks of the cliff with his creations depicting images of the marine world, creating a lot of interest among the inhabitants of Caorle and the many visitors who used to enjoy a relaxing walk by the sea. The success was such that, the following year, the City of Caorle created the International Prize “Scogliera Viva”, which takes place every two years and involves sculptors from around the world. All this has become over the years an open-air museum that you must visit if you are in Caorle!